We recently had the chance to talk to her about her work, her writing, and her reasons for donating. What’s the coolest thing about teaching forest ecology? Getting people to see through a scientific lens. 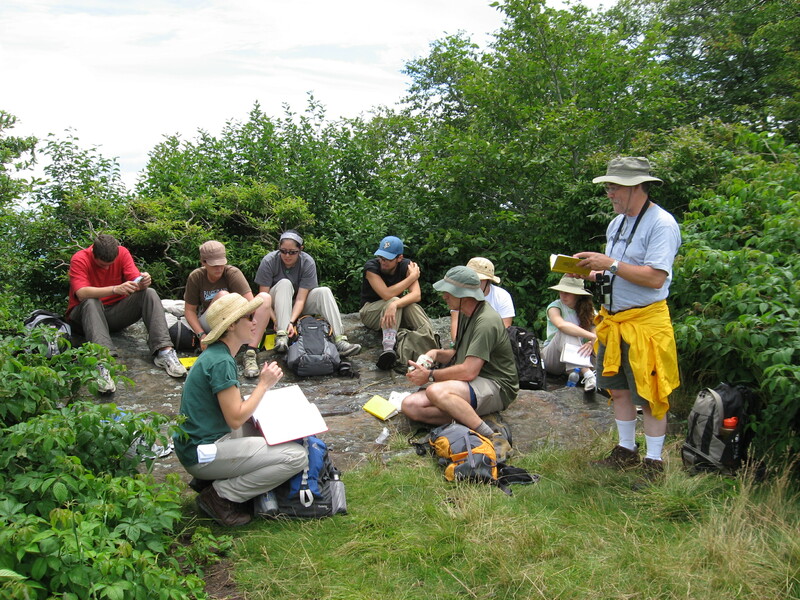 To think like an ecologist, you need to bring together everything you know about botany, geology, chemistry, physics, history, and geography, and use it to read the forested landscape. The challenge lies in knowing what to look for, taking in all the evidence you can find, and weaving it into a unique story for a particular forest. It’s big-picture critical thinking. Watching students take the lead—making observations, asking questions, probing hypotheses, and speculating—in short, thinking like ecologists—is fantastic. You can see it dawning on them that science is really not about what we already know, but instead about discovery. What inspired you to write Exploring Southern Appalachian Forests? What do you hope readers take from the guide? It took us a bit longer to map out our purpose for the book. In the broadest sense, we hope to create more ecologically literate citizens. This is what we hope to accomplish with our readers—to develop their capacity to observe, ask questions, and seek answers. In my opinion, most scientists don’t place enough value on this goal. What’s your most memorable experience from your time as an SCA intern at Chugach National Forest in 1992? My friend Lynn and I did an amazing 20 mile backpacking trip, from the town of Girdwood over Crow Pass and eventually to Eagle River. She had done the hike before and was cool enough not to tell me everything about it—letting me discover the best parts for myself. The first couple of miles are a 2000 foot climb up a talus slope to Crow Pass. I crested the ridgeline and lying before me was an immense expanse of the bluest ice that was Raven Glacier. It was unbelievable! A slightly different breathtaking experience was taking off my boots and wading across the icy, glacier-fed Eagle River. I still carry snapshots from that trip with me: Crossing snowfields. A mama moose and baby. Waterfalls and alpine lakes. A black bear that looked like it might be following us. The expanse of sky and silence. I’d love to go back and run the trail. What did you learn from your time with SCA that still sticks with you today? Communicating science with a public audience. It is an art that continues to challenge and inspire me. In addition, making that mental leap to do something that scared me a bit. I boarded the plane with fifty bucks and no real idea of what I was getting into. But some of the best things I’ve done so far have required the same willingness to give something a try and see what happened. Why do you feel it’s important to support SCA? Speaking as a professor who teaches professional development and mentors a lot of students, I see SCA transforming students all the time. Teaching in the Department of Forestry and Environmental Resources at NC State, I have many students who grew up in rural areas of the state with hunting and fishing as their primary recreational activities, and they want to work in the outdoors. On the other side of the spectrum, we have students who grew up transfixed by the Discovery Channel, who also dream about working in natural resources and conservation. We take pride in giving students real hands-on experience in our classes, but that still can’t substitute for an extended professional experience outside the classroom. All the time, I see students return from internships like SCA whose eyes have been opened to their life’s work. They return re-focused on what they want to do when they graduate. Speaking as an SCA alum, I was that kid. I enjoyed the academic side of my undergraduate courses but getting out there and doing work in the field convinced me that I was heading in the right direction. I still tell my students that it was the best summer of my life. What do you believe is the most important quality for the next generation of conservation leaders to possess? Big-picture, long range thinking and collaboration. We’ve become reactive and to some degree myopic to conservation challenges—we need to be looking ahead and bringing the best people together from a host of different disciplines to solve the monumental conservation challenges we face. Education tends to focus people in specialized areas, but we need more broadly trained Renaissance scientists who can pull together information across disciplines to plan strategically. In addition, we need skillful collaborators who can balance the needs of different groups while keeping a focus on the larger conservation goals.